I’ll stop. 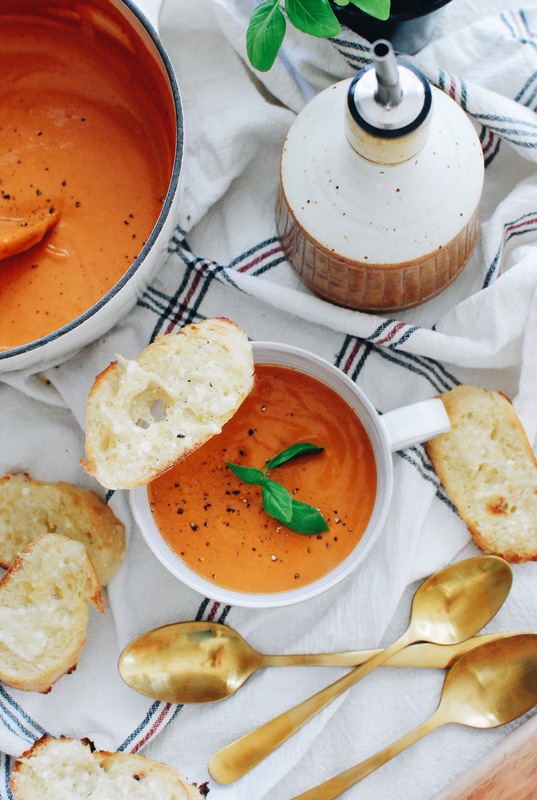 We can talk about this soup. It’s a soup that only those with electricity can make. Which I don’t right now. I don’t have electricity. Just in case you didn’t know. I’m at a coffee shop writing this. In the warmth! With music! And a cappuccino! What LUXURY. Although, I did my makeup in the half dark this morning, so I’m pretty sure I look like a Nick Nolte mug shot. Alright, this soup is STRAIGHT RIDIC. 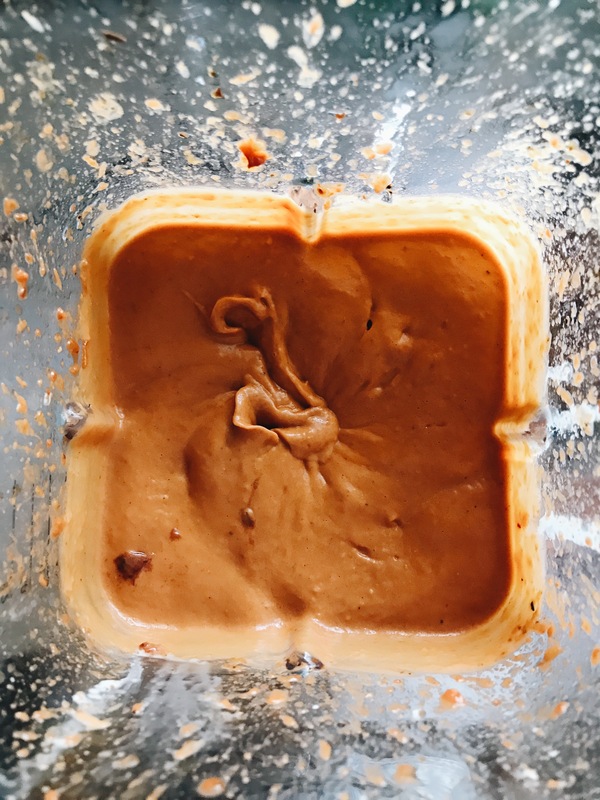 So creamy, so roasted, so umami-y. And easy! You’ll flip out. Watch. Just watch this. This is seriously almost four hours later. Your home smells like BLISS TOWN right now. And then you’ll transfer it all over to a food processor or blender. Even the garlic! Squeeze them out of the their skins and get them in. GET’ EM EEN. I mentioned I have no power, right? Stock, cream, roasted tomatoes, garlic. Your new life. THING IS, add more stock if you like it on the thinner side. I kept mine a tad looser than a puree. Thin enough to dunk some parm toast in it, but thick enough to enjoy my life. Like with electricity, if possible. And for the toast! 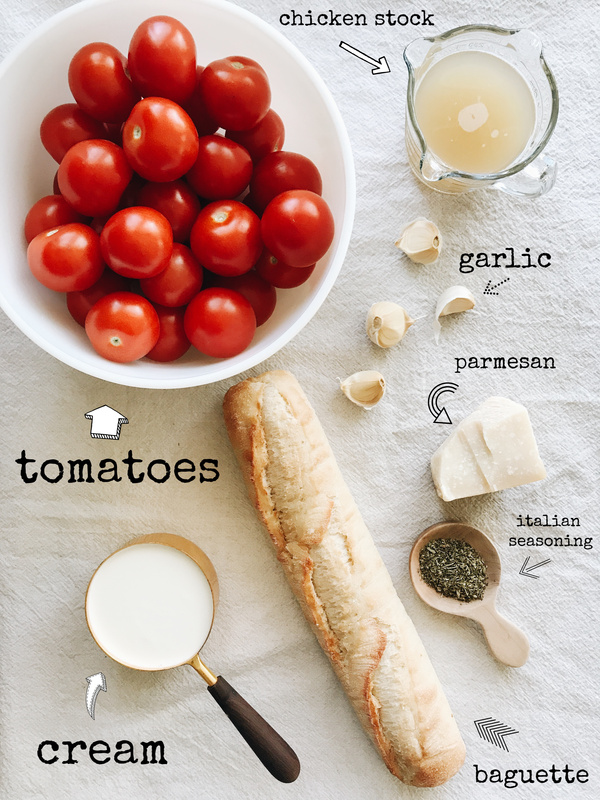 Just slice up a baguette, drizzle with oil, flake some good parm on it, and toast it. That’s it. So delish. And dunkable. Into the creamy soup. That you made in your oven because you have power. Preheat your oven to 325. 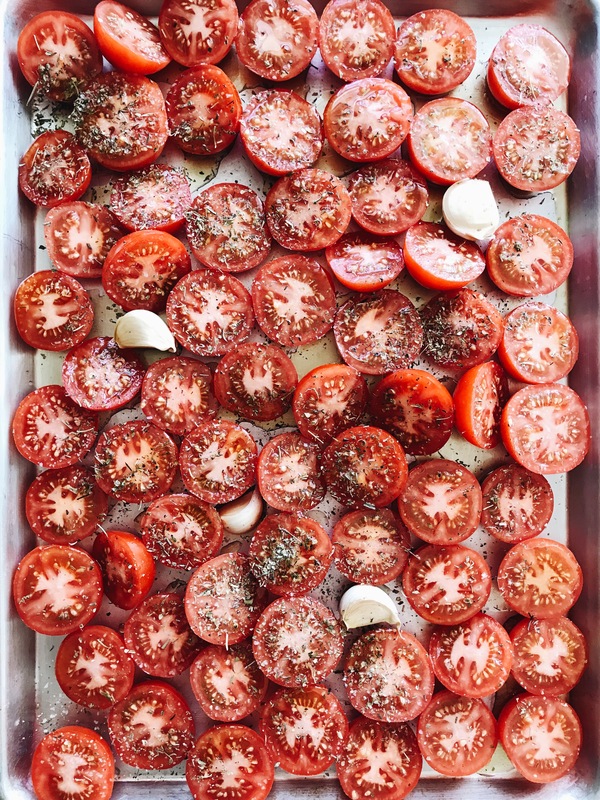 Arrange the tomatoes and garlic on a large baking sheet and pour the oil over them. 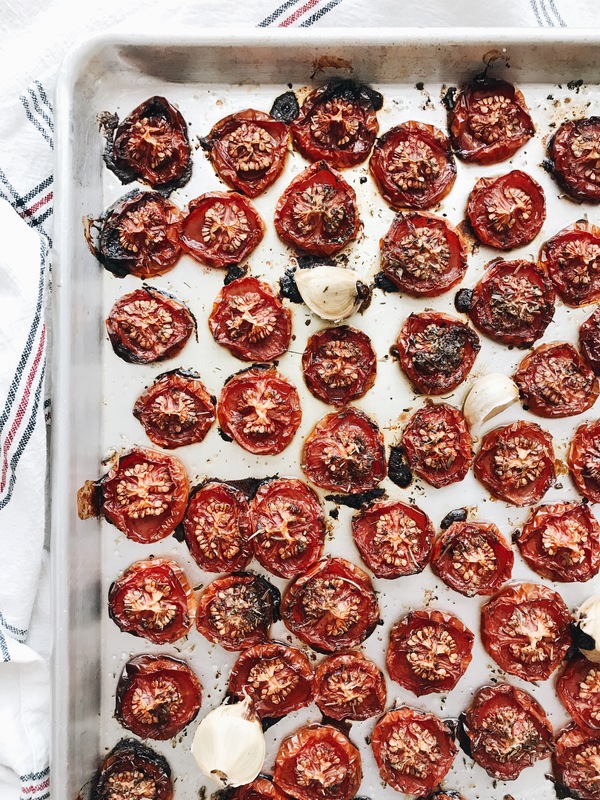 Sprinkle with the Italian seasoning, and a big pinch of salt. Roast for 3 and a half hours. 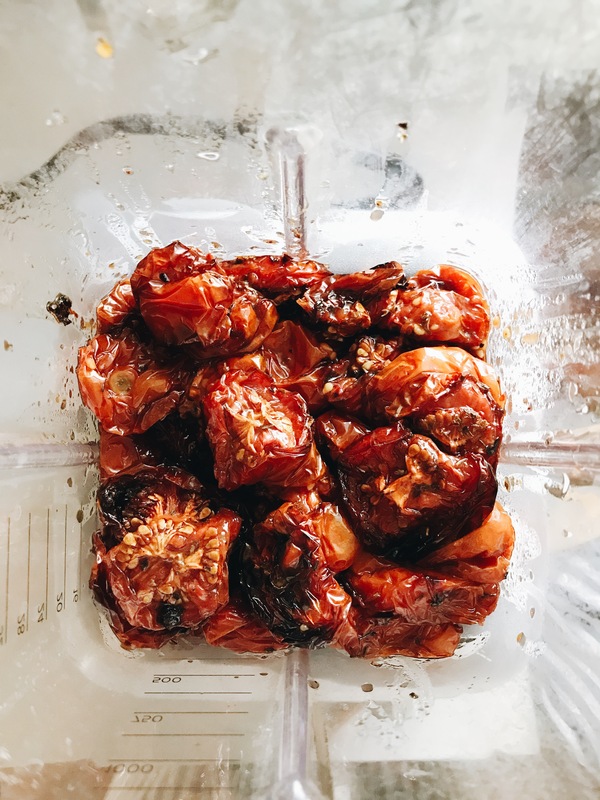 Transfer the tomatoes (and the garlic, squeezed out of their skins) to a blender or food processor. Blend until smooth. Slowly pour in the cream and stock, and blend to become smooth. 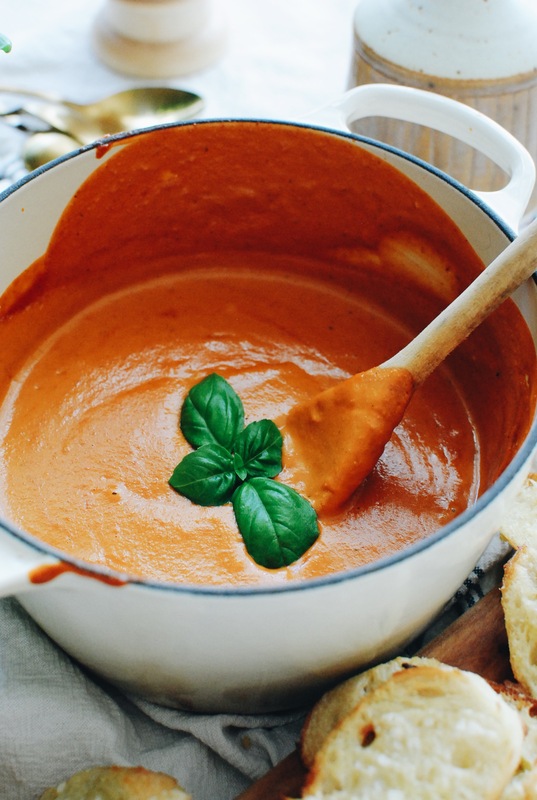 Transfer the soup to a medium pot and bring it to a simmer! Taste it. Need anything? Another little pinch of salt? It’s freaking good, right? Toast the baguette, brushed with a little oil and the parmesan flakes. 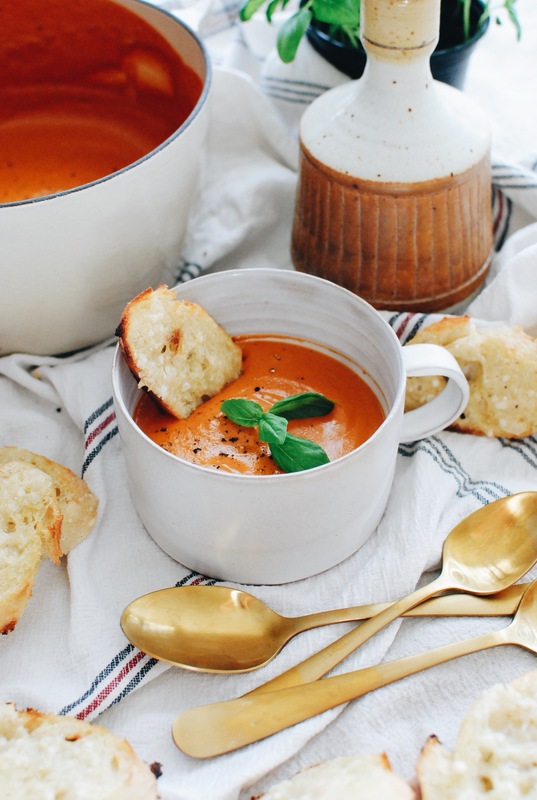 Serve the soup garnished with basil and with the parmesan toast! This looks yum. My daughter will love it. I'm so sorry that stupid power is still out. At least you can put your food outside (at least? That's good? ) but I keep thinking that going potty is not fun...frigid toilet seats...yikes. Your IG stories are hilarious, though. My kids watched the ones from yesterday and cracked up, especially the "beard" one where Aaron's like, "what are you doing?" So funny. You're gonna make it. Οh dear I am having so much fun watching your stories on Instagram, no I am not having fun of you being in the snow with no power but girl you are so funny and ALIVE. 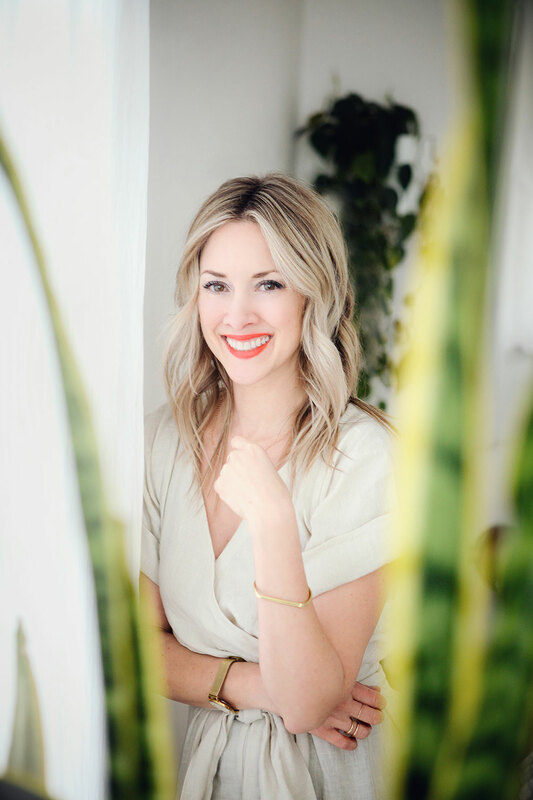 So I decided it was about time to visit your website (yes I haven't done it yet) and I am thrilled. I am going to read all of these posts soon. That's just me, Eleni, from Athens, Greece, sitting on my couch, my laptop plugged in. Looks delish!! 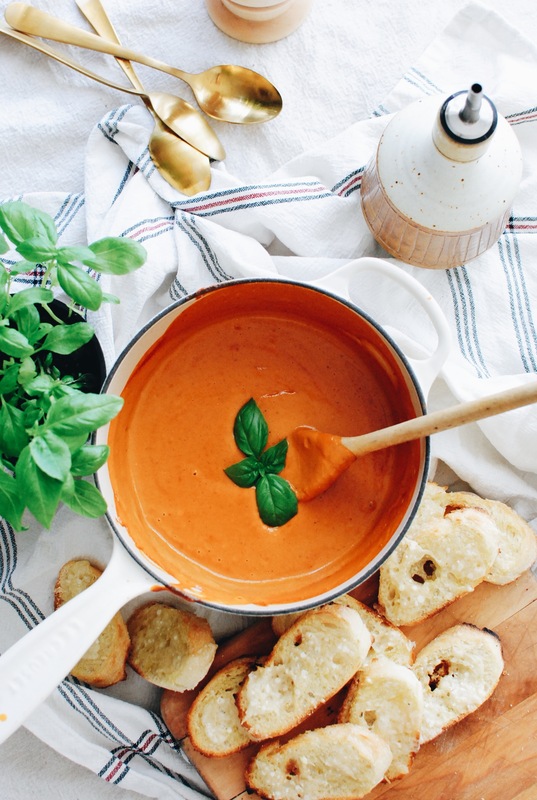 I love a good creamy tomato soup, and this ROASTED version sound awesome. It must be so flavorful! I hope you get power back soon! We lost power for a few days last year during a blizzard, and it was AWFUL. And I wasn't even blogging yet. You must be going nuts. I would be. HANG IN THERE. *wiggles fingers* sending you electricity from the electricity gods (Zeus? anyone else?) soon. It turned out very tasty, but I added a little bit of chopped celery and at the end of a 50 gram smoked chicken breast. For myself personally, I would have done it without meat, and I am sure it would have turned out no worse. But my husband loves meat a lot. Thank you for the great recipe. Ahhh love the tweaks! Thanks for trying it!